1985 bay Mustang Stallion. Live show winner, good photo shower. Model bred pedigree. Bred by VnV Stables. 1991 Palomino Mustang Stallion. Live show placed, nice model and range bred lines. Bred by October Moon. 1992 bay sabino overo stallion. Excellent showhorse in limited outs, blend of real and model pedigree. Bred by VnV Stables/Samantha Kroese. 1993 buckskin Mustang Stallion. Limited showing with good results. Mostly modelbred pedigree. Bred by Cory Hartung/Double Hart Ranch. 1996 black overo Mustang Stallion. Halter champion, model bred pedigree. Bred by Cory Hartung/Double Hart Ranch. 2003 palomino Mustang Stallion. Champion halter horse, LSP. Mostly modelbred/feral breeding. Bred by Kay Myers/Caballos del Mar. 1987 grey (bay base) mare. Live show winner, champion Photo show mare. Excellent model bred pedigree. Bred by VnV Stables. 1988 liver chestnut Mare. Unshown, excellent model bred pedigree. Bred by VnV Stables. 1990 black Mare. Unshown, excellent model bred pedigree! Bred by VnV Stables. 1991 smokey black tobiano Mustang Mare. Unshown, carries the cream gene so is able to produce dilute foals. Dam is range bred. Bred by Rocket City Stables/Amanda Geci. 1995 blue roan tobiano mare. 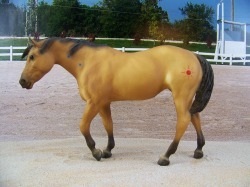 Good show mare, bloodlines are a blend of model and real spanish lines. Bred by VnV Stables/Samantha Kroese. 1995 grey Mustang Mare. Many time halter champion. Modelbred and real Spanish breeding. Bred by Cory Hartung/Double Hart Ranch. 1997 chestnut overo mare. Limited showing with good results. Nice model bred pedigree. Bred by Persimmon hill/Laurel Dedes. 1997 grulla sabino overo Spanish Mustang stallion. Unshown, Spanish mustang breeding. Bred by Heidi Reaves. 1996 grulla Spanish Mustang mare. Unshown. Double Chief Pushmataha and Majuba breeding. Bred by Lake Hill Ranch/Jean Sorensen.